Note that arms are not kept artificially folded; they drop, relaxed, uke, but body remains stable. Nage leans forward over idee. linage has kept One-Point, stability will be maintained. If not, nage will fall. This exercise can be thought of as a physical version of goal setting. M** backward with arms raised overhead but keeping One-Point. ""tended weaUx tofcwfc or stiffly, stability *M be to«. As we have seen, attitude affects One-Point. But One-Point also our attitude, or others' perception of it. In each of these positions, nage recites a passage of poetry or the most matter-of-fact statement, striving for uniformity of breath and intonation. How the voice changes, despite nage's best efforts at uniformity or subterfuge. The emotion conveyed or impact of the statement spoken in each of the three positions. With eyes closed, degree of success at guessing which position (forward of One-Point, over One-Point, or back of One-Point) nage is in at the moment. maang unaer tue mat or underground with just your eyes peeking up skom the mat or above the grass. Siting at the bottom of a quarry, at the bottom of the sea, at the center of the earth. Floating in a bubble in Outer Space where there is no up or down. Being a leaf floating downstream with the current, 2. like test at nage\ request. 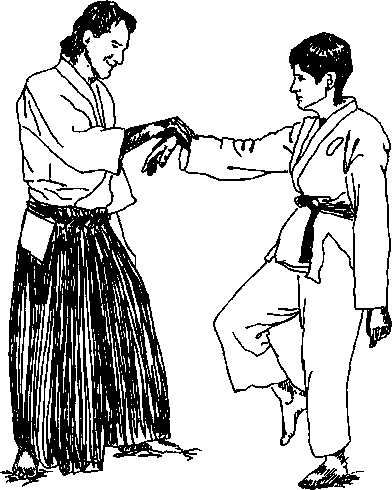 This exercise appears on the ki test list as "Thrusting out one hand, then being pushed by the wrist" (with nage standing in hanmi) and its varia tion, 'Thrusting out one hand and raising one leg." 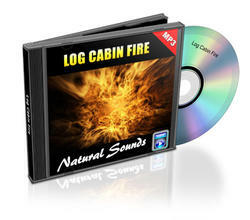 Both are an exercise in transferring energy to the One-Point. Doing so increases stability and flexibility at the same time. 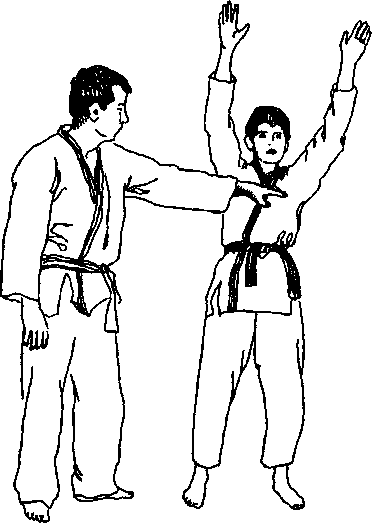 Nage stands with palms forward, the fingers of the left hand pointing up fiaggrsof the right hand pointing down. When the hand positions are reversed? 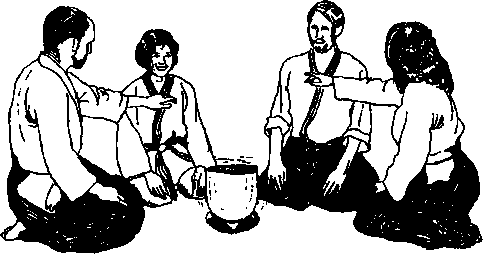 This is the auditory version of tekubi-shindo undo ("wrist shaking exercise"). See the last step in the Three-Minute Ki Exercise for Health (Apendix B). Relaxation does not mean limpness or collapse. It means not expending eneigy unnecessarily, not diverting your energy to fighting yourself. A common example is that of a cat napping in a sunbeam. Her body is completely relaxed, yet if startled, she will be across the room in a flash. Rigidity is not strength. If you try to make Unbendable Arm by making your arm rigid, you are actually hampering yourself and helping the opponent, Your stiff muscles make your arm harder for you to move, while making a wonderful lever for your opponent to move you. A fundamental concept of Aikido is that just because an attacker controls your hand, he does not control the rest of you. The assumption in this equation is relaxation. When you are relaxed, the rest of you is free to move. When you are stiff and tense — the hand rigidly connected to a rigid arm, a tight body, tense legs, and a fixated mind — he does control the rest of you. It is the difference between pushing a broomstick across the floor and trying to push a rope across the floor. Purely physical strength is limited by the physical body. There will always be someone bigger and stronger, if not now, then tomorrow or 20 years from now. O-Sensei was renowned for his strength and muscular uila in his youth. By old age, when purely muscular strength may begin to fail, he had evolved beyond mere muscle and bone into other forms of strength. 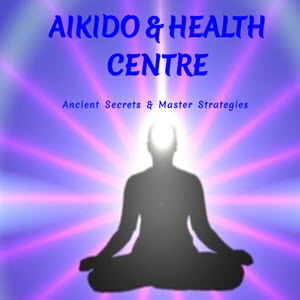 ^ aJlows you to use uke's strength, instead of or in addition to your / y™ a tremendous advantage over a larger, stronger oppo-llatio^rovided you avoid a weight and strength contest. Allowing the sit-^vant*0 deteriorate into a weight and strength contest throws away the it, ali ^ orc*er t0 use u^e's strength and energy, you must stay with the attaclT^ it( So in the direction that it is going. Skillful blending with k 1S a of camouflage, a weapon in and of itself. the w eXamPle> suppose your Fairy Godmother has presented you with ©c Cloak of Invisibility for a trip through the ogre's castle or the dragon's lair. What is the correct use of this weapon? It is to move and gently, leaving no trace of your passing. To reveal your presence by stomping about, kicking over chairs, stc to arm wrestle or punch out everyone you meet would be a waste of* powerful tool. By blending into the attacker's own power and direct ' you disappear; uke will feel only himself— not you — and be unable^ counter. Acquiring this softness and sensitivity is one of the difficulties of Aikido It is terribly tempting to attack uke with sheer muscle power if that is available to you; it is extremely difficult for the physically strong person to abandon what has always worked on weaker persons in favor of softness to all comers. One of the strongest men I have ever known became thoroughly exasperated with my repeated attempts to muscle my way through a technique. "Time out!" he roared, dropped to the mat and challenged me to an arm wrestling match. Wham\ He won. No contest. "Aha!" he said. "I am stronger than you. Just checking." Point taken. Paradoxically, the more you feel that you have done nothing, the more likely it is that you have done the technique correctly. There is an enormous difference between attacking a technique and allowing a technique to happen and it is a difficult lesson to learn. One way out is to make softness itself a challenge. How softly and gently can you do a given technique? It is not necessary to slam and force the opponent. A friend who saw Ueshiba doing a demonstration was impressed that this tiny, elderly man was laying four or five big Air Force martial arts instructors down on the mat. What was most impressive was how he was doing it: "He almost caressed them down." 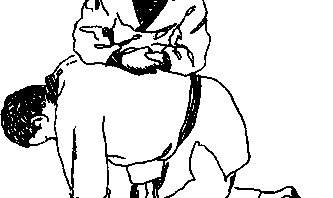 It is this softness and gentleness, this relaxation, that helps make Aikido so devastating, so irresistible, so effective.